Nineteenth century poets were infatuated with the Commedia dell'arte just as Debussy was, and here are some especially relevant examples of their poetry. Pierrot, with his sad face and infinitely malleable character, was a favorite. Banville's "Pierrot" was used as a text by both Debussy and Poulenc. walks along the Boulevard du Temple, lost in thought. at her friend Jean Gaspard Deburau. English translation © 2006 by Bertram Kottmann, reprinted with permission. 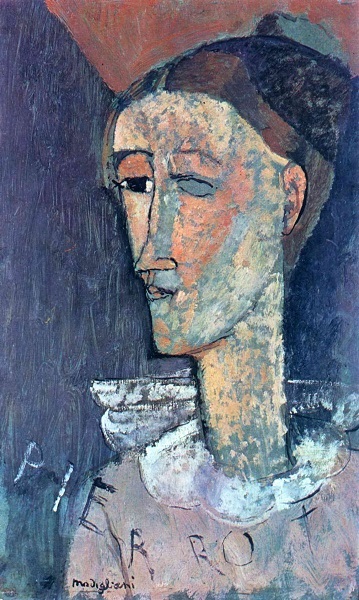 LaForgue (1860-1887) wrote poem after poem about Pierrot. For this influential French poet, the sad clown encompassed every possible madness and gave rise to poetry which glories in the absurd. Vain smile of La Gioconda. And wrinkle their trefoil noses. And rice as white as their costume. They've nothing to do with God at all. In this best of Carnivals!" "Dans la meilleur' des mi-carême!" English translation © 2007 by A. S. Kline, reprinted with permission. And here, find the text to the entire Pierrot Lunaire, made famous in Arnold Schoenberg's revolutionary sprechstimme setting. Written first in French, the poems reflect well the mad Pierrot who also inhabited Debussy's imagination, though Debussy imagined him as a far gentler chap. The moon pours down at night in waves. The wine we drink through the eyes. O could I pluck but one! O brach ich eine nur! Of the taciturn Dandy from Bergamo. The fountains laugh a metallic clangor. The moon illumines the crystal flasks. Stands deep in thought: What makeup for today? With a ghostly light ray. Des schweigenden Dandys von Bergamo. Lacht hell die Fontaine, metallischen Klangs. Erleuchtet der Mond die krystallnen Flacons. Steht sinnend und denkt: wie er heute sich schminkt? Washes faded garments at nighttime. She stretches down into the flood. Like a bleached drop of blood. Färbt die Lippen einer Kranken. Kommst mir nimmer aus den Sinnen! Wie ein blasser Tropfen Bluts! Enchants me like alien melody. Laid over heaven's sable pillow. You dark moon, deathly ill.
Bannt mich wie fremde Melodie. Dort auf des Himmels schwarzem Pfühl. Have blotted out the sunshine. The horizon sleeps - silent. Breathe out an odor, murdering memory. Ruht der Horizont - verschwiegen. Down there in the sepulchers. Bloody drops of ancient glory. To the altar comes - Pierrot! Naht dem Altar - Pierrot! Through night's pall of sorrow. On a black silk cushion. The moon, the shining scimitar. Ohnmächtig bricht er jäh zusammen. Der Mond, das blanke Türkenschwert. Reveling in the scarlet blood! On which they bleed in silence. Far away the noisy rabble. Poems are poets' holy crosses. Prunkend in des Blutes Scharlach! Dran die Dichter stumm verbluten. Fern, verweht der Lärm des Pöbels. Heilge Kreuze sind die Verse! Da vergißt Pierrot die Trauermienen! Lieblich klagend - ein krystallnes Seufzen! So wooden, so sentimental modern? Out of the old Italian pantomime. Then Pierrot forgets the mask of tragedy! Sweetly lamenting - a crystalline sigh. Gently, with a trepan [skull-borer]! From the gleaming pate of Cassander. Dessen Schrein die Luft durchzetert! Aus dem blanken Kopf Cassanders! In her little red dress. Knitting needles gleaming and flashing. Da plötzlich - horch! - ein Wispern! On the back of his black coat. Drat! he thinks: a fleck of plaster! Wipes and wipes, but-can't get it off! A white fleck of bright moon. Auf dem Rücken seines schwarzen Rockes. Warte! denkt er: das ist so ein Gipsfleck! Wischt und wischt, doch - bringt ihn nicht herunter! Einen weißen Fleck des hellen Mondes. Pierrot scrapes on his viola. He plucks a doleful pizzicato. With a grotesquely outsized bow. Knipst er trüb ein Pizzicato. Kratzt Pierrot auf seiner Bratsche. On a fair following wind. And rocks the fragile craft. - Moonbeam is the rudder. Und wiegt den leichten Kahn. - Der Mondstrahl ist das Ruder. Buzzes down the gentle breeze. O redolence from fairytale times. English translation © by Mimmi Fulmer and Ric Merritt, reprinted with permission. Perpetual springtime of renunciations — hate your rise. Towards the earth and her little lunar Orphan-scruff. Sensational Apotheosis of the Umbilical. Nothing less than the price to fix upon your head. Upon the inorganic Aggregate's far sill. A thing like that, I bet, you'd never once suppose? And inoculates itself forever with fresh Moon! English translation © Peter Dale, Poems of Jules Laforgue. London: Anvil Press Poetry, 2001. Large as a fortune calls the tune! Far off the sounds of last post die. The province sleeping like a board! The piano shuts its window tight. What exactly is the time of night? Calm moon, this exile's hell to me. But must one say: so let it be? Of poles, seas — and what I don't know. Her honeymoon she's going on. To Scotland, that's where they have gone. A common cause, one manner take? The province in my heart stuck! Cotton wool stuffed in each ear. La province qui s'endort ! Ils sont partis pour l'Écosse. Damn odd, my darling dove. Damn odd, my darling dove! Qu'alliez-vous faire à la Mad'leine ? Vous vous teniez dans un coin debout. C'était la plaie du Calvaire au cœur. Les Christs n'ont qu'au flanc seul la plaie! Aux Crucifix on n' parl' jamais! C'était du trop d'amour qu'j'avais! Et moi j'te brûl'rai la cervelle! Lui, il aura mon âme immortelle! 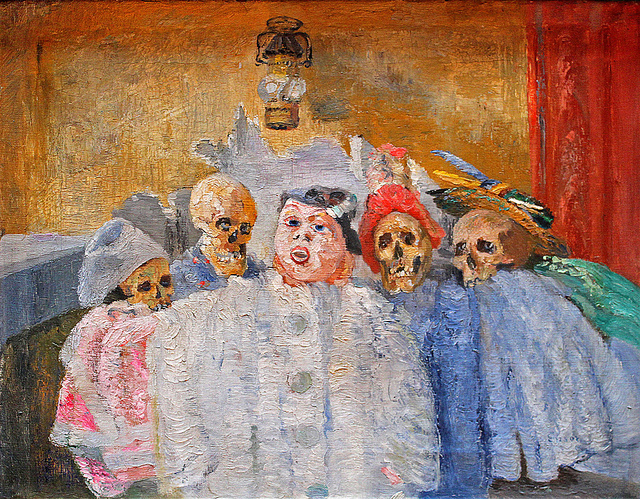 The Belgian painter, James Ensor, makes the macabre links between Pierrot and death all too clear in this and other paintings. The thin line between comedy and tragedy is unmistakable, and Ensor's fascination with masks here spreads from the Commedia to the skeletons which decked his art studio. See here Paris's most famous Pierrot, Charles Duburau, who starred at the Theâtre de Funambules and was immortalized in the film, Children of Paradise. And here, the take of one of Debussy's favorite artists, Redon, on the sad--and here, decaptiated--clown. Picasso was fascinated with the Commedia, transforming himself into Harlequin into a number of paintings and inserting Pierrot and Harlequin into many others. And here another French painter gets entangled with the Commedia. Who would have guessed that this painter, so famous for his elongated women, would portray himself as Pierrot? Maurice Sand, son of George Sand, Chopin's lover, wrote a massive book on the Commedia dell'arte, complete with detailed illustrations. Below is one example. 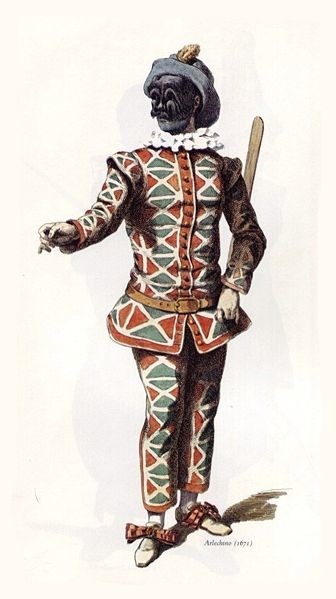 Illustration of Harlequin by Maurice Sand. Harlequin made his way into popular media as well, adorning many a journal cover and feature story. Given that the Commedia was said to originate in Bergamo, and Pierrot was indelibly associated with the moon, Suite Bergamasque's "Clair de Lune" is certainly a first step in comprehending Debussy's relationship to the Commedia. Masques was early on conceived as part of a second Suite Bergamasque, and its title, "Masks," makes clear the link to the Commedia's artfully masked characters. The Etudes have no titular connection to the Commedia, but of all Debussy's works they are the most volatile, the most unpredictable, the most capricious. Their link with the mindset of the Commedia is undeniable. No. 1, Pour les cinq doigts d’après Monsieur Czerny is the most obvious comedic take-off of the lot, for it is, of course, a wicked parody of Czerny exercises. However, its fascination lies in the fact that its prosaic five finger patterns manage, against all odds, to flirt with loveliness, and in fact to frequently become outright beautiful. The music seems to insist that parody and authenticity can exist on the same turf, that the coexistence of opposites is the way of the world. The annoying task of the sullen child and the arabesques of the elevated artist cannot be so easily unraveled from one another, and here one of them constantly interrupts and transforms the other. Eventually Czerny’s opening scales become a form of color rather than a piece of drudgery(e.g. m. 72) and they’re then so pleased with themselves that they multiply in celebration, swirling to a grand finale that traverses the entire keyboard in one last rapid-fire scale. No. 2, Pour les tierces is perhaps the least commedic of the set. Debussy seems more influenced here by Chopin’s etude in thirds than by Pierrot. One thing follows another in rational order and virtuosity reigns, but even here there are scherzando moments that come upon us unexpectedly and remind us that a circus is always lurking around the corner. Measure 6 is the first example, with its tenor melody in staccato emerging suddenly in the midst of such well-oiled legato. Then comes the unprepared intensity of the cry at m. 13, which recurs at the end. As in the other etudes, Debussy calls for rubato here, using the rubato as a way to subvert the predictability of a steady meter. The big difference here is that the outlying moments feel more integrated than ostracized; tempo, dynamic, and articulation are more of a piece in this etude, and distraction is pushed aside rather than encouraged. No. 3, Pour les quartes, delights in the unfamiliarity of quartal harmonies, and the shock of non-sequitors, where one kind of material follows on the heels of another without preparation. The violence of the explosive stretto in m. 7 has nothing to do with the dance-world dolce of the opening, and even the musical terminology used in this Etude is elusive. Where else in the literature does one encounter instructions like “ballabile” and “scherzare?” A new vocabulary was needed to instruct the performer when melodies were fragmentary, rhythms constantly shifting, and rough and frightening fortes prone to burst out in the midst of bucolic tranquility. No. 5, Pour les octaves, does what all octave etudes are supposed to do – it raises hell. But this one not only makes difficulties for the performer, but also for the listener. It would be the rare listener indeed who could accurately follow the meter and conduct this piece. What begins as a recognizable, if unusually boisterous, waltz, quickly sheds that identity, transforming itself eventually into a would-be marimba lick, “très égalment rythmé,” “con sordino” and obviously sans nuance. One can virtually hear drumsticks clicking. That doesn’t last either, though, as the single notes of the marimba multiply into parallel octaves with manically difficult leaps. (m. 76) These subside just as rapidly as the material that follows—the etudes exist in a highly ephemeral universe where change is the only constant. Eventually the opening returns and the piece crashes to an end with a loud, affirmative, and tonal cadence – the acrobat here has earned his applause, but certainly not by dint of any known routine! No. 6, Pour les huit doigts, forms a nice counterpart to “Pour le cinq doigts.” Here the pianist has lost one finger on each hand, condemned to play without a thumb, but whizzing along all the same. This etude, like No. 2, is far more of a piece than most of the others; its whirring 32nds are interrupted notably only once, by heady glissandos followed by trills. These mark the only forte until the end of the piece as well. Note values otherwise shift only from very fast duplets to very fast triplets and even the meter shift from2/4 to 3/4in m. 54, with its newly encountered bass melody, feels integrated. The piece whips itself around with the skill of a magician, and at the end, the magician grins knowingly and plucks his last note very softly --as if to say that all the preceding was smoke and mirrors, and all that really exists is this last pianissimo 8th note. No. 7, Pour les degrees chromatiques, seems to me to mark the reappearance of Puck in La danse de Puck and the fairies of Les fees sont d’exquises danceuses from Preludes, Book I and 11. Debussy must have missed their “sly malice!” This music is similarly airborne, flying through high registers, delighting in mischievous dotted rhythms, and zooming in for an earthly landing only in the very last bars. Almost the entire piece is played at piano or below; the fairies are plotting in whispers. No. 8, Pour les agréments, epitomizes the willingness to undermine every statement with a contrary statement that characterizes both the Commedia and late Debussy. Debussy oscillates between the exquisite embellishments of the opening and the carnival material abruptly introduced in m. 21. The next 20 measures, until the opening returns, constantly teeter between a grave, delicate elegance and a bumptious vaudeville romp. This is one of the most melodious of the etudes, but the melodies are always in flux: the opening 32nd note idea gives birth to melodic ideas so dissimilar that the listener is hard pressed to associate them, let alone hear them in close proximity. As in Etude No. 1, the line is blurry here between comedy and serious theater, but both seem to amicably tolerate life with the other. No. 9, Pour les notes répétées, Even the premise of this etude is perverse, for all those extra repetitions are just a stunt – we would have heard the melody just fine had every note been played only once! The music is appropriately jerky, stopping and starting, and proceeding in fits and starts. It generally smiles on the world, but shifts its vantage points from that of a slightly irascible marionette in the opening to that of a lyrical string player, first in m. 28, then again in 55 and 58. There are strident outbreaks along the way – this etude is the antithesis of smoothness – but the end is reassuring; it saunters to a carefree close, announcing again that everyone involved has come to a friendly understanding. In No. 10, Pour les sonorities opposés, the music starts out in an eerie- almost-Schoenbergian universe of dissonance. It’s the only etude to begin in slow outer space, and it banishes the nervous energy of the previous piece entirely. We hear immediately that the piece will be about both opposing sonorities and opposing registers, or opposites colliding. The low gongs which pervade the opening follow us through much of the piece, and the crossed hands first indicated in m. 7 are also omnipresent, signaling perhaps a physical crossing of opposing fields. Strangely out of place in this mysterious universe, a pert dotted-rhythm figure manages to escape the overriding solemnity (m. 31), and it refuses thereafter to be banished completely. We forget its insouciance while attending to the next episode, an increasingly impassioned tenor melody again played with crossed hands, but it is intrepid, returning twice more and dominating the ending. Even in the midst of this intense gravity, Debussy’s joker makes himself known. Likewise in Etude No. 11, Pour les arpèges composés, the delicacy of the music, so firmly established by cascades of sensual arpeggios, is eventually displaced by burlesque humor. The first hint appears in m. 25 when the heretofore seamless flow of notes is interrupted by a rest and a quick fortissimo upward spiral. The staccatos and marcatos and “un poco pomposo” of m. 25-28 then prepare us for the “giocoso” section beginning in m. 29, where the music stops and starts unpredictably and appears to delight in being disrupted. We lurch along with it, taking the bumps in good humor, but wondering whatever became of that “dolce e lusingando” we’d been primed for at the beginning. It returns, though not entirely unscathed – a somewhat chastened clown makes his presence felt again in m. 58 and 60. Once again, an armistice between opposing aesthetics has been arranged, and in this case, the clown has been subdued and finally put to sleep. No. 12, Pour les accords, is bombastic, almost diabolical in its rhythmical trickery. Its plays on 6/8 bring “Masques” to mind, but here the knavery has upped the ante. Only in Brahms had 6/8 meter previously met so many incarnations, and Brahms wasn’t nearly as roguish about it. For one thing, he didn’t make pianists jump around on the piano as if it were their private trampoline; Banville’s exhortations to his clown to jump higher, ever higher ring very true here! For another, Brahms provided a smoother ride; energy levels didn’t zoom from maximum to minimum with barely a transitional gear in between. Debussy’s hard-pressed athlete finds himself floating amidst barely-moving static harmonies in the middle of the piece just as he’d warmed up his speediest act. He gets to start jumping again, though – if Debussy had known Energizer Bunnies he might have welcomed them into this steely Commedia!